If you teach kindergarten (or even if you don't), you probably have an opinion on the concept of kindergarten morning work. 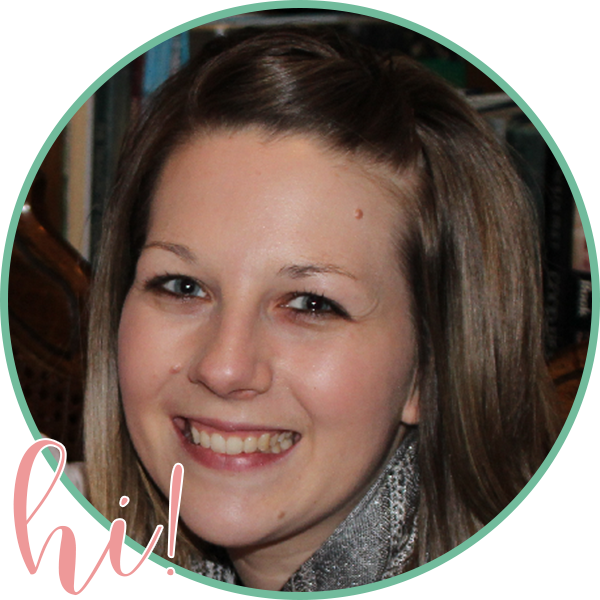 Today, I'm going to share my thoughts about the benefits of two types of morning work and give you some ideas about what might work in your own classroom! When I was in the classroom, my kindergarten team and I had various forms of morning work between our classrooms. Most weeks when I was doing my planning, I dreaded coming up with what my students would complete for morning work. I usually used pages that we hadn't had time for, or I used supplemental pages from our reading series. 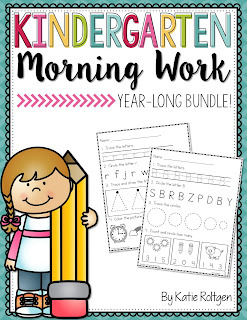 During my last year teaching kindergarten, I started working on an actual morning work pack. I needed something that provided spiral review, yet was simple enough for my students to (mostly) complete on their own. Once I started providing them with morning work that was consistent in appearance and style, I noticed that not only did I spend less time planning morning work, but my students were truly more independent. I felt better about what my students were working on, and confident that if my principal walked in, my students would be on-task. And if your students are anything like mine, they craved that sense of independence! Morning work pages with a consistent style gave them predictable activities and a greater sense of understanding. 1) The number of activities per page should be limited. Nothing is more daunting to a young learner than a page filled up with six, seven, or more different, unrelated tasks. 2) The activities are review activities and do not attempt to teach a new skill. Morning work is never the way to teach a new skill. 3) The activities use clear graphics and fonts, and provide help when needed. For example, my morning work pages provide help when a new skill is introduced or when otherwise necessary. Some children may still need help, but the traceable "hint" can really help some other children figure out what they should do. In the example below, I provided a traceable oval around the B and the number 3 to help students realize they should be circling the B's and the number of objects. - Some students love having a familiar-looking activity to begin their day. I had a student in particular who had a great deal of trouble focusing throughout the day and struggled with transitions, but he loved his morning work because he knew what to expect every day. - It fits seamlessly into the morning routine. You can have it ready on the students' tables, or have them pick up their copy. Since you can run your copies for the whole month, it really requires very little prep. You can even get your monthly morning work bound for each student. - It helps some children settle into "school-mode". Mornings are h-e-c-t-i-c. Morning work requires a certain amount of focus, and it eases the transition from arriving at school to being ready to learn. - It is a way to help students feel successful. By providing a review activity, students who may be struggling have a pretty good chance at being able to complete at least a portion of their morning work independently. - It builds independence. Kindergarten provides tons of opportunities for children to learn to become more independent, and they'll love the sense of accomplishment they feel when they add another skill to their "I can do it" list! I have morning work packs available for September through June. There are 25 pages per pack, so if you need to start using them in August, you'll have plenty of pages to make it through the year. You can click on the image below to see the discounted bundle, and be sure to click on the Preview to see a breakdown of the skills month-by-month! 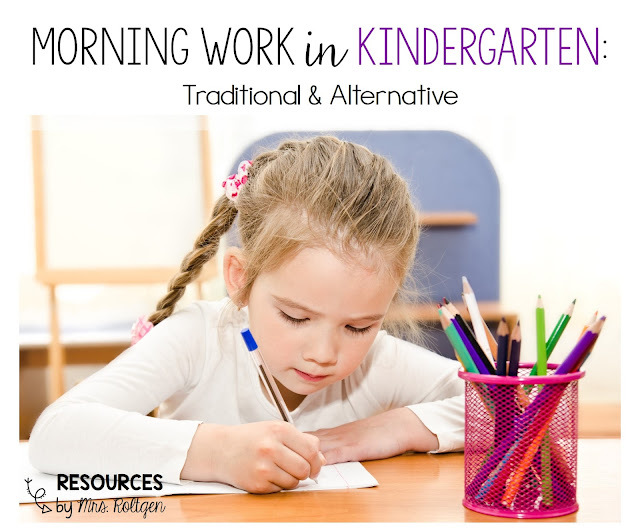 So, if you're feeling like traditional morning work won't work for your group of learners, or you're itching to try something new, let's chat about morning work tubs! Morning work tubs take a variety of forms across kindergarten classrooms. 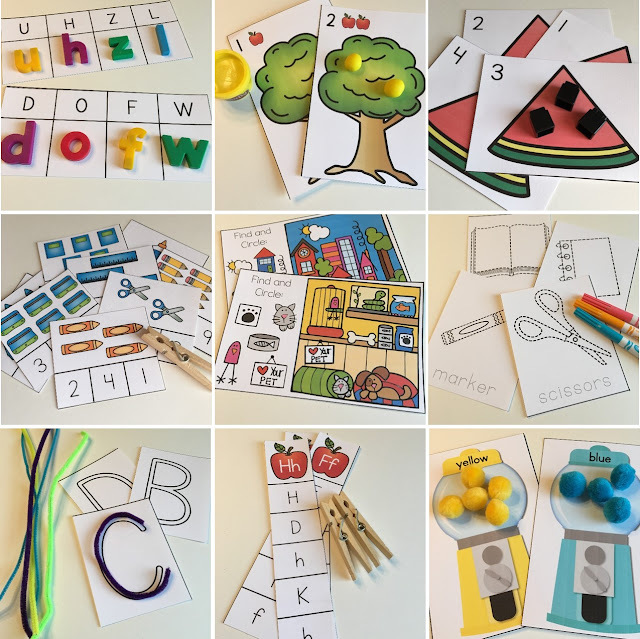 The great thing about them is that they're flexible and easily tailored to the materials you have access to and the types of activities your students enjoy. As far as organizing morning work activities that aren't paper and pencil-based, there are a variety of things that work. If you have a place to keep small plastic tubs, you can develop a system using that. Labeling the tubs and designating their spots on the shelves is the key to keeping it as hassle-free as possible. You could also place the activities into gallon-sized baggies and rotate them around your students' tables each day. Students love getting to use pipe cleaners, playdough, and magnetic letters! Here's a look at some of the activities that I created. You will notice that they are heavy in fine motor skills, colors, letters, counting, and even have some other fun tasks like symmetry and locating hidden pictures. - They are more hands-on. And hands-on activities like these can really help improve fine motor skills and strength! I included clothespin and playdough activities and those especially help with this. - They can be tailored to seasonal themes or your students' interests. If you want to do apple-themed activities, or if your students cannot get enough of counting bears, morning work tubs are a great way to build some extra fun into your day. - You can use them to build more student choice time into your day. That is, if you allow students to pick their own morning work tub. - You can use them to build cooperative learning and play. Whether or not students complete the tubs together, they will likely be more engaged with their peers doing morning work tubs vs. morning work pages. If I have piqued your interest in these activities, click on the image below to check them out. Click on the Preview button on TpT to see a picture of all 20 activities that are included. I'm still working on tub activities for future months. Stay tuned! So, there you have it. Those are my thoughts on morning work options for kindergarten. I really don't think there is a clear-cut answer about which is best. I think some students I've had would benefit from the structure of morning work pages, while others would benefit more from the tub activities. You have to choose what works for you, considering your students' needs, your organization and planning needs, and so on. I know some amazing teachers who use morning work tubs, and I know equally amazing teachers who use morning work pages. I know other teachers who use before-school time for free choice centers or dramatic play. They all have the best needs of their students in mind, and that's really what it boils down to! What are your thoughts on morning work in kindergarten? I'd love to know! Leave me a comment below! My son began attending Phoenix pre-k at the age of 3, he's 5 now and sadly his last day was yesterday. I do not have any negative things to say about his time there.